Kevin Tahan had just finished a three-hit performance with a home run to lead his Vigilantes to a comeback win in August 1998. The win kept the independent Mission Viejo team in position for the playoffs and Tahan's efforts helped take pressure off his teammates, Tahan told The Los Angeles Times. "If you want to go to the playoffs, you have to step up," Tahan told The Times. "You can't rely on one guy to get you there, and we had been doing that with (teammate) Alan [Burke]. It was also one of his last. Tahan was in the 10th and final season of his professional baseball career. It was a career where he spent five seasons in independent baseball, all after a career in affiliated ball where he never made it higher than AA. Tahan's career began a decade earlier, taken by the Cardinals in the 43rd round of the 1989 draft. He was taken out of after grabbing a share of his college's home run record hitting his twelfth that April in a U.S. International win over Cal-State Fullerton. 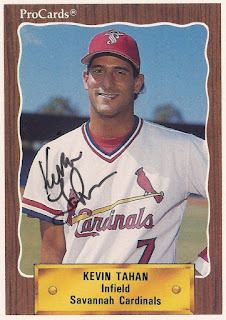 Tahan spent his 1989 season with the Arizona rookie league Cardinals, hitting .294 in 50 games. Tahan played 1990 at single-A Savannah, his batting average dropping to .222. In an August game, Tahan helped send his Cardinals into extra innings with a squeeze bunt. 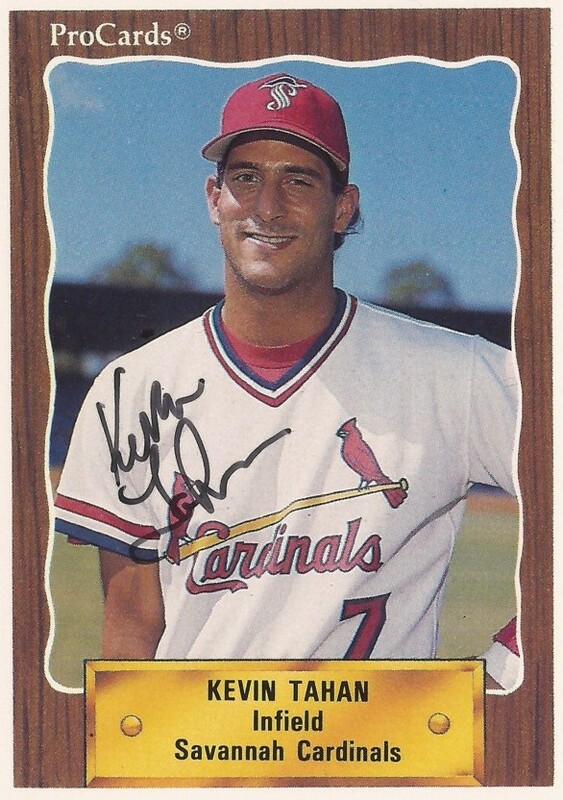 He spent the bulk of 1991 at single-A Springfield in the Midwest League, hitting .263 in 97 games. Tahan also saw time that year at high-A St. Petersburg. Tahan spent 1992 back at Springfield, hitting .268 with five home runs. That earned him a look at AA Arkansas for 1993, but he only got into 35 games and hit just .154 and ending his time in affiliated ball, short of the majors. Tahan made one more attempt at the majors, albeit the replacement majors, in spring 1995. He hit a home run off of Oil Can Boyd March 16. Tahan hit the independent circuit for 1994, spending his first of three seasons with the Texas-Louisiana League's Amarillo Dillas. He set the team record for RBIs in 1995 with 95, hitting .333 on the year. He played 1997 with the Alexandria Aces, driving in two runs against his former team Amarillo in a game that July. It was in mid 1998 that Tahan joined Mission Viejo. That was after a stint in Taiwan, according to The Times. By then, Tahan was 31 years old, the oldest member of the Mission Viejo, The Times noted. His night that August, also came on his birthday, his 32nd. "This was big for the whole team," Tahan told The Times. "It's nice to do something like this on your birthday - it's nice to do it any time [because] we're still in the hunt for a playoff spot; we don't have much margin for error."